is a single component, solvent free, fastdrying primer. With PCI Lastogum makes perfect combination to make your shower area waterproof. The primer can be used with most types of floor, highly recommended for wooden and wood-base materials surfaces, plaster boards, paint coating, finish material and cementous floor leveler. Is it reliable bond of coverings and screeds to the substrate. 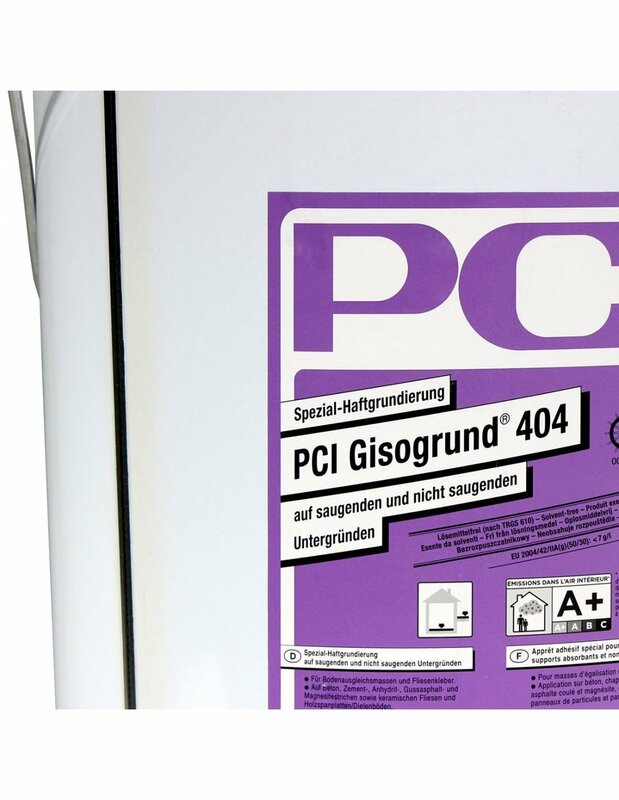 PCI Gisogrund 404 can be diluted with water and adapted to the absorbency of the substrate. Also, characterized with reliable adhesion with tile adhesives. After application of primer, surface is walkable after approx. 3 hours. 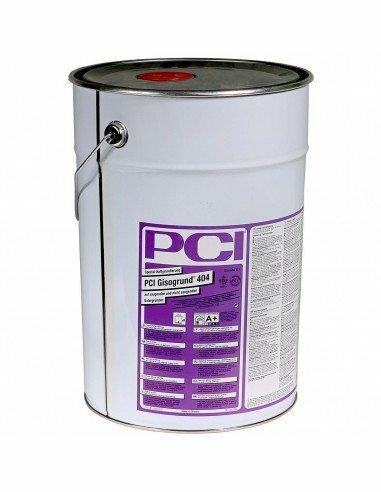 PCI Gisogrund 404 20L bag will cover approx. 100 to 200m², depending on what surface it is used. Consumption approx. 100 to 200 ml/m² • The consumption is dependent on absorbency and structure of the substrate. Very low emission PLUS, GEV-EMICODE EC 1 PLUS. Colour violet for good coverage control. The substrate must be structurally sound, clean, dry, free of oil and residues which could impair adhesion. The substrate condition must meet the requirements of any further coverings. 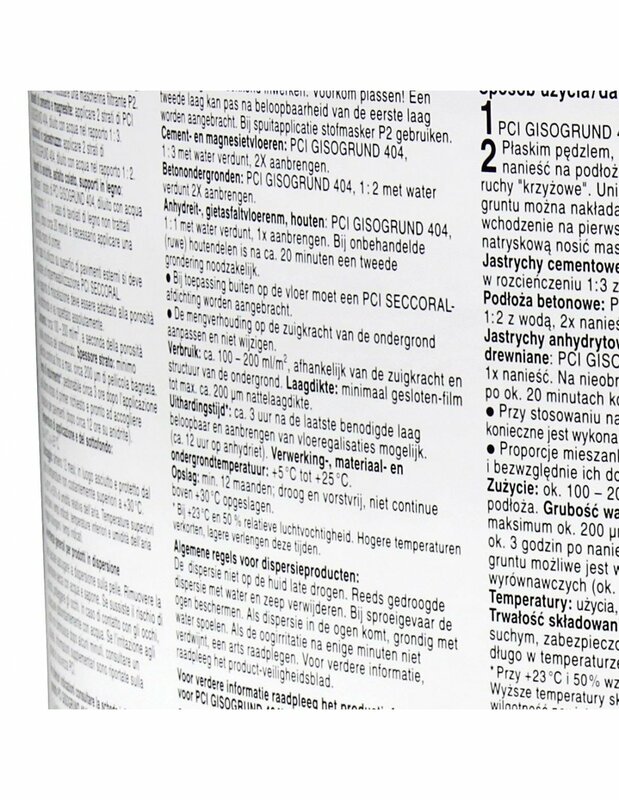 Shake PCI Gisogrund 404 well before use. Pour primer onto the clean and prepared substrate and spread in crisscross method using a fine-pored foam roller, surface scraper, soft brush or flat bristle brush. Avoid puddles forming! A second coat of primer can be applied when the first coat is walkable. Use particle filter mask P2 for spray application. Cement screeds and magnesite screeds Prime with PCI Gisogrund 404, diluted 1 : 3 with water, apply two layers. Concrete substrates Prime with PCI Gisogrund 404, diluted 1 : 2 with water, apply two layers. Anhydrite screeds, mastic asphalt screeds, wooden substrates Prime with PCI Gisogrund 404, diluted 1 : 1 with water, apply one layer. Untreated (raw) wooden floorboards and particle boards require a second coat of primer as soon as walkable. Prime old ceramic and natural stone tiles with undiluted PCI Gisogrund 404, one layer. Floor levellers and coverings can be subsequently applied to the cured and walkable primer. The waiting time of 12 hours must be observed for anhydrite substrates. Do not use PCI Gisogrund 404 at substrate temperatures below +5 °C and above +25°C. The mixing ratio must be adapted to the absorbency of the substrate and strictly followed. Apply a generous amount of primer and brush in well. Avoid puddles forming, spread out excess primer. The surface finish must be removed by rough-grinding and thorough cleaning prior to applying PCI Gisogrund 404 to water-repellent ceramic (e.g. Ceramic plus by Villeroy & Boch). When using PCI Gisogrund 404 outdoors, it is required to protect the primer with a subsequent waterproofing layer (e.g. PCI Seccoral) before laying ceramic or natural stones. Clean tools and mixing buckets with water immediately after use. When the product has cured it can no longer be removed with water. Storage: min. 12 months; dry and protected from frost, no permanent storage over +30°C. 20l can was enough for a whole bathroom and a kitchen. It dries pretty fast. Chat started. Session ID: 1556251388. You are now connected to: David M.